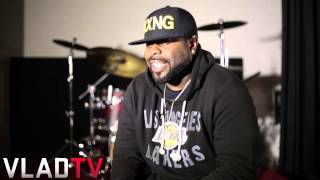 Crooked I: They're Trying to Tear Down Suge's Legacy Like O.J. http://www.vladtv.com - Crooked I explained his relationship with Suge Knight during an exclusive interview with VladTV, and the Long Beach rapper says that they still keep in touch after he left Death Row. The Slaughterhouse rapper adds that Suge even called him up and said some nice words after Eminem signed him to Shady Records. During the conversation, Crooked I also spoke about Suge's legacy, and believes that the media is trying to ruin the music exec's name. The rapper likens the situation to that of Bill Cosby and O.J. Simpson, and says that the media just doesn't ride with Suge. Jan 06, 2015 · 4 comments for "Crooked I: They're Trying to Tear Down Suge's Legacy Like O.J." Most Daps: Crooked I: They’re Trying to Tear Down Suge’s Legacy Like O.J. They're Trying to Tear Down Suge's Legacy Like O.J. January 22nd it’s going down! ... They’re selling a limited pressed edition (only 1000 copies) for ... ©2014 Siccness Network.